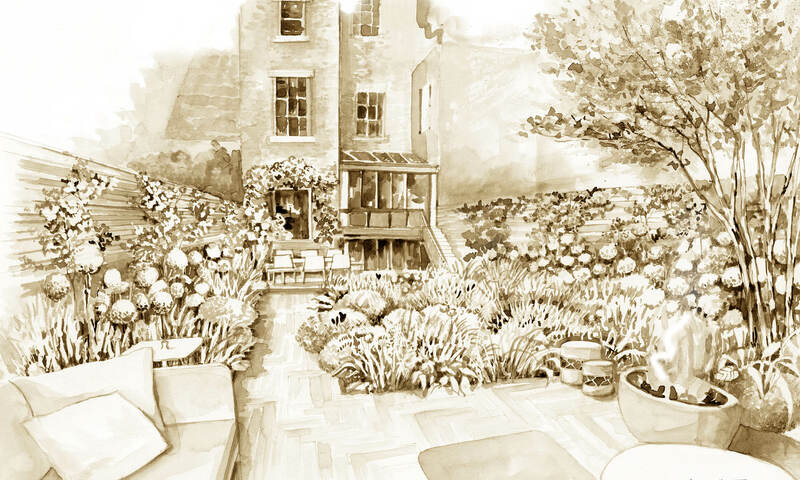 Working on the large, west-facing garden of this lovely Georgian house in South Kensington has been one of our most exciting projects this year. Our work in the garden was part of the full restoration of the house by London-based architects’ practice MWAI, and Taramelli, a building contractor operating worldwide. When we first saw the site in Pelham Crescent it was a rather gloomy place, filled with evergreen plants and shrubs that had all been clipped into severe shapes. No flowering plants or perennials had been planted to soften this formal effect, so that despite its sunny position, the garden was not a place to relax. There were already two terraces on the site made from slabs of Indian stone laid in a random pattern. One was below the house and one at the garden’s far end, and yet there was nothing but a small patch of grass to link the two of them together. And to make matters worse, the nearer of the two terraces sloped towards the house, so that it drained onto the basement steps. Working closely with the client, we decided to rid the garden of the clipped plants and tiny lawn, filling the entire space instead with perennial plants, bulbs and shrubs that would produce bursts of changing colour, scent and texture every day of the month in each season of the year. We kept the two terraces, although we replaced their stone slabs with delicate Belgian bricks laid in a herringbone pattern, and made sure that the nearest of the two drained away from the house. The lawn had always been too small to be of any practical use, and now we took it up, linking the two terraces instead with a brick path along one side of the site. The nearer terrace, which is conveniently close to the house, is the sunniest spot in the garden, and this makes it the ideal place for alfresco dining. We have furnished it with a table and chairs, and an array of low, ornamental pots that can be planted up for each season. The further terrace is a more intimate, sheltered space that we will furnish with comfortable sofas, low tables and our trademark fire pits made from elegant terracotta pots. The only trees on the site were two limes growing beyond the terrace at the far end of the garden. We have left these alone, because they create a good screen without casting too much shade. However, the garden lacked flowering trees, and we have put this right by planting a mature, multi-stemmedCornus kousaat its far end, where it acts as a screen for the shed, while forming an attractive focal point. Already five meters high, it will produce beautiful blossom each spring, followed by pretty autumn berries. We have also planted Chionanthus virginicus, the fringe tree, placing it so that its delicately-scented, creamy-white flowers will overhangthe path in late spring and early summer. The fringe tree was already almost 2m tall when we planted it, and like the Cornus, it had to be hoisted into the garden over the roof of the house. With the trees in place, we planted the shady areas around them and against the garden walls with Hydrangea aspera, Hydrangea quercifolia,Hydrangea arborescens‘Annabelle’, for its huge globes of tiny white flowers in midsummer, and Hydrangea paniculata‘Limelight’, with itsstartling, acid green blooms. The beds below these shrubs are packed with shade-loving hostas, ferns and Disporopsis pernyi– an evergreen form of Solomon’s seal. For the winter months we have planted flowering hellebores and the winter-scented Sarcococca confusaor sweet box. The bright purple berries of Callicarpa bodinierivar. giraldii ‘Profusion’ will bring a blaze of colour to this scented winter garden. Snowdrops will herald the spring here in Pelham Cresent, followed by a rich mix of bulbs and corms, including daffodils, cyclamens, and combinations of the very dark tulip ‘Queen of the Night’ with pure white ‘Angel’s Wish’ tulips and little yellow aconites. We have used the fresh green leaves of Hakonechloa macra‘Greenhills’, a small ornamental grass, to blur the distinction between planting in shade and sunny areas of the garden, where we have planted perennials in groups of 3, 5 and 7. The rhythm of these repeated groups of plants runs through the garden, bringing a sense of peace and purpose to this elegant oasis in central London.